Singapore Airlines’s new service to Canberra and Wellington has featured plenty of empty seats during its first months of operations, new figures suggest. According to the Bureau of Infrastructure, Transport and Regional Economics (BITRE) monthly report on international airline passenger and freight numbers, SIA’s flights between Singapore and Canberra were roughly half full in October, the first full month the route has been in service since it launched on September 20. However, the Canberra-Wellington leg has not been as well patronised, with only a quarter of the seats filled. The BITRE data indicated SIA carried 2,599 inbound passengers from Singapore to Canberra in the month of October, when it operated 18 flights. Given flight SQ291 is operated by Boeing 777-200s configured with 38 angled life-flat business class and 228 economy class seats for a total seat count of 266, the BITRE data suggested SIA’s average load factor on Singapore-Canberra was 54.3 per cent. Meanwhile, the reciprocal SQ292 carried 2,011 passengers from Canberra to Singapore in October, which represented an average load factor of 44.5 per cent. The Singapore-Canberra-Wellington rotation, which the Star Alliance member dubs the “Capital Express”, operates four times a week. It is the first scheduled international passenger service to Canberra more than a decade after the short-lived Air Pacific (now Fiji Airways) flights to Nadi ended in 2004. The flight also links the capitals of New Zealand and Australia for the first time. However, passenger numbers of the Canberra-Wellington leg were lower than that of Canberra-Singapore. The BITRE data showed SIA carried 1,163 passengers from Canberra to Wellington in October, which represented an average of 65 passengers per flight for an average load factor of 24.3 per cent. The return Wellington-Canberra service averaged 68 passengers per flight, which represented a load factor of 25.5 per cent. It is worth noting a December 2016 report in The Canberra Times indicated the BITRE figures do not include passengers travelling from Wellington to Singapore and beyond via Canberra, or travellers headed to Wellington from Singapore via Canberra. Indeed, the report quoted Singapore Airlines ACT manager Tan Chin Yu saying: “We have been encouraged by the support from the local community since we went on sale in January and remain pleased with the number of customers choosing to travel on the new service, both to Singapore and beyond with direct connections to UK/Europe. “There has been a good mix of business and leisure travellers in both the business and economy class cabins,” he told the newspaper. Canberra is SIA’s sixth destination in Australia alongside Adelaide, Brisbane, Melbourne, Perth and Sydney. The airline group’s regional wing Silkair also serves Cairns and Darwin with narrowbody equipment. The Virgin Australia shareholder and alliance partner is adding more flights to Brisbane, Melbourne and Sydney in 2017. SIA has also boosted its premium passenger offering with a new SilverKris lounge at Brisbane Airport. Overall, the BITRE figures showed SIA had an average load factor of 89 per cent for its flights to Australia and 77.9 per cent for its flights out of Australia in October. The BITRE data for the first full month of SIA’s Canberra operation suggests the passenger numbers will take some time to build up, given Singapore and Wellington are new nonstop markets for the city and that the route was first launched in January, meaning the figures represented the efforts of about seven months of marketing and promoting the new route. However, there will be more international seats to fill out of Canberra from as early as the second half of calendar 2017, with Qatar Airways planning to launch service to the Australian capital. In November, Qatar named Canberra as one of eight new destinations being added to its fast-growing network. The oneworld alliance member indicated flights to Canberra would begin some time in the 2017/18 timeframe, without providing any further details, such as frequencies and operating aircraft type. The Australian capital would be Qatar’s fifth destination in this country. It currently serves Adelaide, Perth, Melbourne and Sydney nonstop from its Doha hub. Canberra Airport managing director Stephen Byron said discussions were ongoing with a number of other Australian and overseas airlines about international flights, which could lead to a new service starting before Qatar begins its operations to Canberra. “We always thought there would be a race to be first to be second if you like,” Byron told reporters at Canberra Airport on November 29. “We’ve been talking to the other Middle Eastern hub carriers, to the other Asian hub carriers and also to the Chinese airlines about direct flights. The BITRE report showed SIA carried 74.4 tonnes of freight into Canberra in October, with 34.7 tonnes of cargo taken to Singapore. There was negligible freight between Canberra and Wellington. Do those figures include those flying from WLG to SIN and back only transiting through Canberra? As they’re technically not passengers originating from or arriving in Canberra. I’ve flown the route, and it was about 90% full when I did it – although obviously, there could be plenty of days when it’s empty. From what I understand these figures do not include pax transiting Canberra from or to Wellington, so I would bet the numbers to be higher overall. October is a traditionally slow month as well, if you look at ADL figures with QR and EK you would see lots of their flights going out half full. I think not a bad overall start. It would be interesting to see if this route is getting strong numbers at the front of the cabin which is what was hoped. Suspect this would be a great route for the A321 Neo LR… if only SQ had any on order! Unfortunately the B772 with 266 seats is the smallest cabin SQ can throw at the route. A two-class A332 would have been ideal, slotting under the reconfigured 266 seat B772. Canberra is another Australian market that would seem to be best served by B757/A321NeoLR sized aircraft – not great for full size business cabin layout, but much closer to market capacity, with the necessary range to get into Asian ports. It would seem that there are several Australian airports that really need the ultra long range narrow body Middle of Market aircraft types to be viable. Remember the 777-200 is only temporary. SQ is replacing both the 777-200 and A330-300 with the A350-900. An A321lr, with a business cabin similar to American or Jet Blue 321s, would be perfect match for this route! In fact probably would enable a daily operation. Note these figures do not include through traffic just to and from Canberra so probably quite good figures for SQ. QF may think of a dozen A321-LRs for Canberra and Adelaide (and a few other places) to Singapore. SQ A350-900 has 253 seats in 3-class arrangement so it is the lowest seat capacity. Agree with comments about A321 NEO LR in Australia…. we have many cities that would support lower capacity services. Will the local airlines move their fleet planning in order to hub bust and equip with A321/MoM aircraft, and will regional carriers also see potential in direct low capacity links with these class of aircraft (noting Phillipine Airlines has already)..
Looks like wide-body types might be too much plane for many routes into and out of Australian cities, particularly the minor capitals and major regional cities. Intercontinental aircraft (4000+ nm) with maximum 150-200 seats (most likely a single aisle narrow-body) would seem to be about where the route capacity is for cities like Canberra, Hobart, Newcastle, Townsville, Sunshine Coast and Darwin, and even some services into cities like Adelaide, Cairns, and Gold Coast. It would appear now to be a stand-off between passengers who want direct services to these smaller ports, versus airlines who would have to either equip specifically for them or maintain status-quo with hubbed operations and risk continuing to disenfranchise a not-insignificant section of their passenger market. Since SIA is passing out its 772’s and A333’s from its fleet and replacing them with A350-900’s, there is some speculation that SIA may temporary operate Scoot SIN/CBR/WLG to allow the market to grow as a more leisure market. The subsidies that SIA is getting from Canberra and Wellington to operate the services, is for 12 months, so SIA will continue operating by reducing from 4 to 3 return services during the winter and the current 4 flights during the summer. The SIN/CBR/WLG is an unique route for SIA, it might be a learning curve for them. If Qatar is planning a Doha to Canberra service, then I do not see SIA pulling their SIN/CBR service. A new route has to be given time to settle in. (12 months plus). October/November is a quiet time of year for international pax in this region. As noted, only sector pax numbers given. Eventually, A350-900 will be used, much more efficient. Air NZ not exactly supportive even though a Star member….poor. There are more variables, but beyond the scope of this comment. Let’s support SQ as much as we can. Well done to them and all parties involved. My experience flying the route CBR-SIN-CBR in November was that a significant number of the passengers originated from / heading to Wellington. Both directions I estimated about 80% full, having said that I had an empty seat next to me both directions. It was however a welcome relief to not have to transit SYD or MEL and I am doing all I can to encourage others to utilise it. The figures are right if you go off Table 5. 1163 passengers flew just CBR-WLG vs 1222 passengers flew just WLG-CBR. If we then added the Table 5 numbers in on SIN-CBR (2599) and CBR-SIN (2011) to the transit numbers we would get a good idea of the load factor. Not a bad performance for CBR’s first international route! Not sure what is meant by Air New Zealand not being supportive on this route? They code share as NZ3291/NZ3292 with SQ on this route.. I have flown this route and the service is second to none. I encourage more and more residents in the Canberra and surrounding region to support this service. It beats taking the Murrays Bus to SYD or transiting through SYD and MEL airrports wirth Qantas and Virgin every time. I plan to fly again on CBR WLG CBR service in April and the CBR SIN CBR service in May. Air NZ is a reluctant partner in the SIN/CBR/WLG service. Air NZ has been opposed for a long time, to see international flights to other international destinations from Wellington other then the east coast of Australia. Air NZ wants all WLG/SIN travel to go through Auckland. The same for QF. who wants all WLG/SIN travel to go through Sydney, so they are not happy about SIA service, as it strengthens the business case to extend Wellington airport. for B787/A350 aircraft. SIA has always seen Wellington as their 3rd New Zealand destination and I feel that SIA is pretty committed to the SIN/CBR/WLG service. There is untapped market out of Wellington and the surrounding regions and from Canberra in both business, leisure travel and freight. Both Canberra and Wellington cities are committed to make the service work, hence the large subsidies to make the service work. I am from Canberra and frequently travel to Wellington for family reasons. However the Singapore Airlines is just too expensive when travelling with family and we are better off driving to Sydney and catching a Wellington flight from there. I hope SIA can do something about the cost. Note to airlines – More routes connecting disaffected underserviced non-hub cities please. Wellington and Canberra were both hopelessly overlooked prior to this. How many more city-pairs, both across the Tasman and wholly within Australia, could be effectively linked on international services particularly if new ultra long-range mid-capacity aircraft become available. For years Newcastle was basically ignored (save for Aeropelican flying from a footpath at Belmont) – the airlines almost seemed shocked when Williamtown turned out to be a raging passenger success, so international ambitions are probably not misplaced; Townsville hasn’t grown its base passenger load for almost 10 years despite wildly optimistic projections, but a lone Bali service is hardly a grand commitment from the airport nor the airlines to help that passenger load malaise and the supporting infrastructure issues to change markedly; Hobart continually calls for a resumption of international services but would seem to be off the radar despite international freight growth aiding their case; Sunshine Coast has a seasonal service to NZ but little else (albeit to this point due largely to airport infrastructure). Surely there is a market for airlines following the lead of both Singapore (CBR/WLG) and Phillipines (CNS/AKL) in finding city pairs (particularly trans-Tasman) that can collectively provide the required combined passenger catchment for viable services….. particularly if A321neoLR or its future Boeing counterpart (the B757 successor?) has the range to get deep into Asia. Why not pair Wellington with Newcastle, or Wellington with Sunshine Coast, or Hobart with Canberra, or Sunshine Coast with Townsville …. all one stop through services to Asia with a dedicated aircraft, combined flight number and through baggage. The intermediate city gets two additional destinations for what is ostensibly one service/route – which is a great way to build a route network and the required intertia to sustain international infrastructure (customs, duty free, lounges etc). Internal Australian services no doubt have cabotage restrictions…. meaning the ball is fairly in the court of a local carrier to make those connections happen, but it would seem that the Singapore and Phillipines services are the tip of the iceberg for an airline/airlines willing to play in and equip for these direct/one-stop services. This could kill off the idea the Wellington city council has of extending the runway at Wellington Airport. If the demand just isn’t there then what is the point of spending millions to make the runway longer for bigger aircraft, I go to the US once a year and last year I went from WLG to AKL and then to Houston. But this year Virgin have a better deal so I will fly WLG to SYD and then LAX. It’s nice to have a choice but how many people who live in Wellington will want to fly to the US direct ? Glen, have a good perusal of the various PDF’s that exist supporting the essential runway extension. They can be found at the WLG official website. The demand is there and building…. China and especially India are growing aviation countries that are driving Asia Pacific air travel growth which is already healthy. WLG needs to take advantage of this. Do some research on Birmingham airport (UK) and see the growth there as a result of their runway extension. Christchurch and Canberra are other examples. Tokyo Haneda has extended one of its runways and immediately attracted longer haul destinations. What about safety? 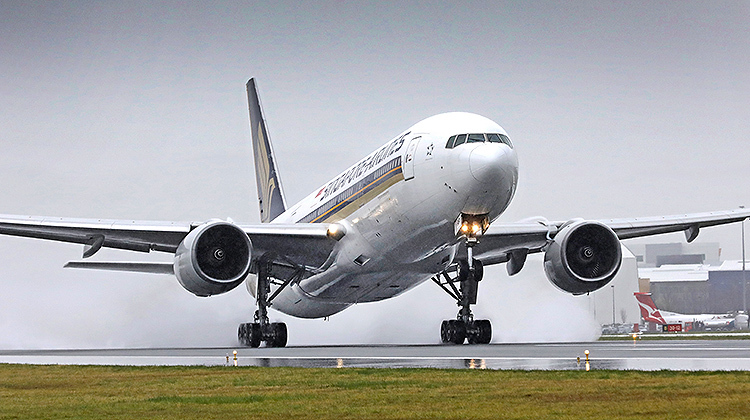 A longer runway affords greater safety margins for pilots in inclement weather especially. Don’t we all want that? WLG does have the occasional inclement weather! Wellington is such a beautiful and vibrant city with so much to offer and it needs to be promoted for NZ and also the central region. It will work. Give it time. See my comments above. A runway of modest length is essential.